Saint Eligius (or in French, Eloi) was born at the "villa" of Chaptelat (modern Cadillac? ), six miles west of Limoges, in Aquitaine (now France), into an educated and influential Gallo-Roman family. His father sent him to apprentice with the goldsmith Abbo, master of the mint at Limoges. Later Eligius went to Neustria where he worked under Babo, the royal treasurer. Eligius later became the chief counselor to Dagobert I, Merovingian king of France. He took advantage of this royal favor to obtain alms for the poor. On the death of Dagobert in 639, Queen Nanthild took the reins of government, the king Clovis II being a child. During this regency, Elegius launched a campaign against simony in the church. On the death of Acarius, Bishop of Noyon-Tournai, in Clovis's third year (642), Eligius was made his successor, with the unanimous approbation of clergy and people. He undertook the conversion of the Flemings, Frisians, Suevi, and the barbarian tribes along the North Sea coast. He made frequent missionary excursions and also founded a great many monasteries and churches. Eligius died December 1, 659 or 660 and was buried at Noyon. He is the patron saint of goldsmiths and other metalworkers and of horses and those who work with them. The earliest mention in an authentic historical authority of Saint Bibiana (Viviana, Vivian, Vibiana), a Roman virgin and martyr, occurs in the Liber Pontificalis, where, in the biography of Pope Simplicius (468-483), it is stated that this pope "consecrated a basilica of the holy martyr Bibiana, which contained her body, near the 'palatium Licinianum' " (ed. Duchesne, I, 249). This basilica still exists. In later times a legend sprang up concerning her, connected with the Acts of the martyrdom of Saints John and Paul and has no historical claim to belief. According to this legend, Bibiana was the daughter of a former prefect, Flavianus, who was banished by Julian the Apostate. Dafrosa, the wife of Flavianus, and his two daughters, Demetria and Bibiana, were also persecuted by Julian. Dafrosa and Demetria died a natural death and were buried by Bibiana in their own house; but Bibiana was tortured and died as a result of her sufferings. Two days after her death a priest named John buried Bibiana near her mother and sister in her home, the house being later turned into a church. It is evident that the legend seeks to explain in this way the origin of the church and the presence in it of the bodies of the above mentioned confessors. The account contained in the martyrologies of the ninth century is drawn from the legend. An alternate account says that in the year 363, emperor Julian made Apronianus Governor of Rome. Bibiana suffered in the persecution started by him. She was the daughter of Christians, Flavian, a Roman knight, and Dafrosa, his wife. Flavian was tortured and sent into exile, where he died of his wounds. Dafrosa was beheaded, and their two daughters, Bibiana and Demetria, were stripped of their possessions and left to suffer poverty. However, they remained in their house, spending their time in fasting and prayer. Apronianus, seeing that hunger and want had no effect upon them, summoned them. Demetria, after confessing her faith, fell dead at the feet of the tyrant. Bibiana was reserved for greater sufferings. She was placed in the hands of a wicked woman called Rufina, who in vain endeavored to seduce her. She used blows as well as persuasion, but the Christian virgin remained faithful. Enraged at the constancy of this saintly virgin, Apronianus ordered her to be tied to a pillar and beaten with scourges, laden with lead plummets, until she expired. The saint endured the torments with joy, and died under the blows inflicted by the hands of the executioner. The above mentioned Saint Bibiana (of the 4th century) should not be confused with Saint Vibiana (of the 3rd century), who is the patroness of the Roman Catholic Archdiocese of Los Angeles. Saint Francis Xavier (Basque: San Frantzisko Xabierkoa; Spanish: San Francisco Javier; Portuguese: São Francisco Xavier; Chinese: 聖方濟各沙勿略) (7 April 1506 - 2 December 1552) was a Spanish pioneering Roman Catholic Christian missionary and co-founder of the Society of Jesus (Jesuit Order). The Roman Catholic Church considers him to have converted more people to Christianity than anyone since St. Paul. He was born in the family castle of Xavier (from Basque etxe berri, "new house") near Sangüesa and Pamplona, in the Kingdom of Navarre, on 7 April 1506. He was the youngest son of Juan de Jasso, privy councillor to King John III of Navarre (Jean d'Albret), and Maria de Azpilcueta y Xavier, sole heiress of two noble Navarrese families. At age 19, Francis Xavier went to study at the University of Paris, where he received a licence ès arts in 1530. At the Collège of Sainte-Barbe, Xavier was assigned to share a room with Ignatius Loyola(Indigo). Under Ignatius' influence, Xavier and six others, including fellow roommate Pierre Favre, discerned lives of service in the Catholic Church and made religious vows at Montmartre on August 15th, 1534, the feast of the Assumption. Their small company would eventually become the first Jesuits with the official founding of the order in 1540. 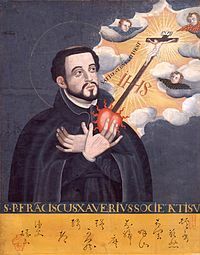 Francis Xavier devoted much of his life to missions in foreign countries. As King John III of Portugal desired Jesuit missionaries for the Portuguese East Indies, he was ordered there in 1540. He left Lisbon on April 7, 1541, together with two other Jesuits and the new viceroy Martim de Sousa, on board the Santiago. From August of that year until March 1542, he remained in Mozambique then reached Goa, the capital of the then Portuguese Indian colonies on May 6 1542. His official role there was Apostolic Nuncio and he spent the following three years operating out of Goa. On September 20, 1543, he left for his first missionary activity among the Paravas, pearl-fishers along the east coast of southern India, North of Cape Comorin. Xavier reached Japan on July 27, 1549, but it was not until August 15 that he went ashore at Kagoshima, the principal port of the province of Satsuma on the island of Kyūshū. Shortly before Christmas, he left for Kyoto but failed to meet with the Emperor. Xavier worked for more than two years in Japan and saw his successor-Jesuits established. He then decided to return to India. He died on 3 December 1552, at age 46. Saint Barbara, known as the Great Martyr Barbara in the Orthodox church, was a Christian saint and martyr, who lived in the third century. The hagiography of Saint Barbara says that she was born about 300 A.D. in Nicomedia, Bithynia in Asia Minor. Her father, Dioscurus, was the head of a wealthy aristocratic family. Her parents loved her for her beauty, intelligence and modesty. Dioscurus, who was cruel and a pagan, had her shut in a tower in order to preserve her from suitors. Influenced by the deacon Valentinus, who later became a bishop and martyr himself, she secretly converted from Polytheism to Christianity. Her father commanded that she be built a bath-house, so that she would not have to use the public baths. The design for the bath-house originally had two windows, but Barbara had a third installed to commemorate the Trinity. She also carved a cross into the marble floor. Her father, seeing these changes, discovered that she was a Christian. Dioscurus went to his daughter, and when she tried to convert him to Christianity he became furious and wanted to kill her. However, her prayers created an opening in the tower wall and she escaped. Pursued by her father and guards, she hid in a gorge in the mountains. She stayed hidden here until a shepherd betrayed her. As legend has it, the shepherd was transformed into a marble statue and his herd into grasshoppers. Despite being tortured, Barbara held true to her faith. During the night, the dark prison was bathed in light and new miracles occurred. Every morning her wounds were healed. Torches that were to be used to burn her went out as soon as they came near her. But she did not waver from her faith. Her father had her taken to a Roman imperial magistrate during a persecution of Christians, who ordered her to be beheaded, and directed that her father carry out the sentence himself. He dragged her up to a mountain and killed her. However, after having done so, he became frightened and tried to flee but, according to the story, was struck dead by lightning in divine retribution. This was the fourth miraculous occurrence during Barbara’s long and painful martyrdom, and according to the legend, Barbara died a martyr’s death on 4 December 306 A.D. Juliana of Nicomedia suffered martyrdom along with Barbara and is likewise venerated as a saint. St. Barbara is one of the Fourteen Holy Helpers (also known as Helpers in Need). Her association with lightning has caused her to be invoked against lightning and fire; by association, she is also the patron of artillery and mining. Her feast is celebrated on December 4 in the Tridentine use of the Roman Catholic Liturgy; in the 1969 reformed Roman Catholic liturgical calendar her public cultus was suppressed to a purely local celebration, and her name was dropped from the litany of saints. Sabbas the Sanctified (439-531/532) was a Palestinian monastic. Sabbas was born at Mutalaska, near Caesarea of Cappadocia, the son of John, a military commander, and Sophia. His parents left their five-year-old son in the care of an uncle. When the boy reached eight years of age, he entered the monastery of Flavian located nearby. When he was seventeen years old he received monastic tonsure. After spending ten years at the monastery of Flavian, he went to Jerusalem, and from there to the monastery of Euthymius the Great. When Euthymius died (c. 473), Sabbas withdrew from the Lavra and moved to a cave near the monastery of St. Gerasimus of Jordan. After several years, disciples began to gather around Sabbas, seeking the monastic life. As the number of monks increased, the Great Lavra sprang up. The traditional dating of the founding of this Lavra in the Kedron Valley, south of Jerusalem, is 484. Because some of his monks opposed his rule and demanded a priest as their abbot, he withdrew to the New Lavra which he had built near Thekoa. In the Lavras the young monks lived a cenobitical life, but the elders a semi-eremitical one, each in his own hut within the precincts of the Lavra, attending only the solemn church services. A strenuous opponent of the Monophysites and the Origenists he tried to influence the emperors against them by calling personally on Emperor Anastasius I at Constantinople in 511 and on Justinian I in 531. Sabbas founded several more monasteries. Many miracles took place through the prayers of Sabbas: at the Lavra a spring of water welled up, during a time of drought there was abundant rain, and there were also healings of the sick and the possessed. Patriarch Salustius of Jerusalem ordained him in 491 and appointed archimandrite of all the monasteries in Palestine in 494. Sabbas composed the first monastic Rule of church services, the so-called Jerusalem Typikon, for guidance of all the Palestinian monasteries. He died in the year 532. Saint Nicholas was a Lycian saint and Bishop of Myra (in modern-day Antalya province, Turkey). He was born during the third century in the village of Patara. At the time the area was Greek. He had a reputation for secret gift-giving, but is now commonly identified with Santa Claus. Nicholas was never officially canonised; his legend simply evolved among the faithful. In 1087 his remains were abducted and removed to Bari in southern Italy, so that he is also Saint Nicholas of Bari. Among Orthodox Christians, the historical Saint Nicholas is remembered and revered. Saint Nicholas is the patron saint of sailors, merchants, archers, children, and students in Greece, Belgium, Bulgaria, Georgia, Russia, the Republic of Macedonia, Slovakia, Serbia and Montenegro. He is also the patron saint of Barranquilla (Colombia), Bari (Italy), Amsterdam (Netherlands), Beit Jala in the West Bank of Palestine and Russia. In 1809, the New-York Historical Society convened and named Sancte Claus the patron saint of Nieuw Amsterdam, the Dutch name for New York. Thus, Saint Nicholas could also be considered as the patron saint of New York. Nicholas was born in Asia Minor during the third century in the Greek colony of Patara in Lycia in the Roman province of Asia—today Antalya, Turkey—at a time when the region was Hellenistic in its culture and outlook. Nicholas became bishop of the city of Myra. He was very religious from an early age and devoted his life entirely to Christianity. According to one legend, as a young man Nicholas went to study in Alexandria and on one of his sea voyages from Myra to Alexandria he is said to have saved the life of a sailor who fell from the ship's rigging in a storm. Another legend tells how a terrible famine struck the island and a malicious butcher lured three little children into his house, and killed and slaughtered them and put their remains in a barrel to cure, planning to sell them off as ham. Saint Nicholas managed to resurrect the three boys from the barrel. In his most famous exploit however, a poor man had three daughters but could not afford a proper dowry for them. This meant that they would remain unmarried and probably would have to become prostitutes. Nicholas went to his house under the cover of night and threw three purses filled with gold coins through the window opening onto the man's floor. Attributes: Episcopal vestments. In Eastern Christianity, a Gospel book and omophorion. Patronage: Children, sailors, fishermen, the falsely accused, pawnbrokers, thieves, many cities. Prayer: Glorious St. Nicholas, my special patron, from thy throne in glory, where thou dost enjoy the presence of God, turn thine eyes in pity upon me and obtain for me from our Lord the graces and helps that I need in my spiritual and temporal necessities (and especially this favor [petition or intercede here], provided that it be profitable to my salvation). Be mindful, likewise, O glorious and saintly Bishop, of our Sovereign Pontiff, of Holy Church, and of all Christian people. Bring back to the right way of salvation all those who are living steeped in sin and blinded by the darkness of ignorance, error, and heresy. Comfort the afflicted, provide for the needy, strengthen the fearful, defend the oppressed, give health to the infirm; cause all men to experience the effects of thy powerful intercession with the supreme Giver of every good and perfect gift. Amen. V. Pray for us, O blessed Nicholas. O God, who has glorified blessed Nicholas, Thine illustrious Confessor and Bishop, by means of countless signs and wonders, and who dost not cease daily so to glorify him; grant, we beseech Thee, that we, being assisted by his merits and prayers, may be delivered from the fires of hell and from all dangers. Through Christ our Lord. Amen. Saint Ambrose (c. 338 – 4 April 397), was a bishop of Milan who became one of the most influential ecclesiastical figures of the fourth century. He is counted as one of the four original doctors of the Church. Ambrose was born into a Christian family between about 337 and 340 and was raised in Trier. He was the son of a praetorian prefect of Gallia Narbonensis; his mother was a woman of intellect and piety. There is a legend that as an infant, a swarm of bees settled on his face while he lay in his cradle, leaving behind a drop of honey. After the early death of his father, Ambrose followed his father's career. He was educated in Rome, studying literature, law, and rhetoric. Praetor Anicius Probus first gave him a place in the council and then in about 372 made him consular prefect of Liguria and Emilia, with headquarters at Milan. There was a deep conflict in the diocese of Milan as well as the rest of the Church between the Trinitarians and the Arians. In 374, Auxentius, bishop of Milan, died, and the Arians challenged the succession. Ambrose went personally to the basilica where the election should take place, to prevent an uproar which was probable in this crisis. His address was interrupted by a call "Ambrose for bishop!" which was taken up by others upon which he was uni-vocally elected bishop. Within a week, Ambrose was baptized, ordained and duly installed as bishop of Milan. According to legend, Ambrose immediately and forcefully stopped Arianism in Milan. In 386 the emperor and his mother Justina, along with a considerable number of clergy and laity professed the Arian faith. The imperial court was displeased with the religious principles of Ambrose, however his aid was soon solicited by the Emperor. When Magnus Maximus usurped the supreme power in Gaul, and was meditating a descent upon Italy, Valentinian sent Ambrose to dissuade him from the undertaking, and the embassy was successful. Ambrose ranks with Augustine, Jerome, and Gregory the Great, as one of the Latin Doctors of the Church. Theologians compare him with Hilary, who they claim fell short of Ambrose's administrative excellence but demonstrated greater theological ability. Saint Eucharius is venerated as the first bishop of Trier. He lived in the second half of the third century. According to an ancient legend, he was one of the seventy-two disciples of Christ, and was sent to Gaul by Saint Peter as bishop, together with the deacon Valerius and the subdeacon Maternus, to preach the Gospel. They came to the Rhine and to Elegia (Ehl) in Alsace, where Maternus died. His two companions hastened back to St. Peter and begged him to restore the dead man to life. St. Peter gave his pastoral staff to Eucharius, and, upon being touched with it, Maternus, who had been in his grave for forty days, returned to life. The Gentiles were then converted in large numbers. After founding many churches the three companions went to Trier where the work of evangelization progressed so rapidly that Eucharius chose that city for his episcopal residence. Among other miracles related in the legend he raised a dead person to life. An angel announced to him his approaching death and pointed out Valerius as his successor. Eucharius died on December 8, having been bishop for twenty-five years, and was interred in the church of St. John outside the city. Valerius was bishop for fifteen years and was succeeded by Maternus, who had in the meantime founded the dioceses of Cologne and Tongeren, being bishop altogether for forty years. The staff of St. Peter, with which he had been raised to life, was preserved at Cologne till the end of the tenth century when the upper half was presented to Trier, and was afterwards taken to Prague by Emperor Charles IV. In the Middle Ages it was believed that the pope used no crozier, because St. Peter had sent his episcopal staff to St. Eucharius; Innocent III concurs in this opinion (De Sacrif. Missæ, I, 62). The same instance, however, is related of several other alleged disciples of St. Peter, and later criticism interprets the staff as the distinctive mark of an envoy, especially of a missionary. Missionaries in subsequent centuries, e. g. St. Boniface, were occasionally called ambassadors of St. Peter, the pope who sent them being the successor of Peter. Moreover, in medieval times the foundation of a diocese was often referred to as early a date as possible, in order thereby to increase its reputation, perhaps also its rights. Thus Paris gloried in Dionysius Areopagita as its first bishop; similarly ancient origins were claimed by other Frankish dioceses. In time, especially through the ravages of the Normans, the more reliable earlier accounts were lost. When at a later period the lives of primitive holy founders, e. g. the saints of ancient Trier, came to be written anew, the gaps in tradition were filled out with various combinations and fanciful legends. In this way there originated in the monastery of St. Matthias near Trier the famous chronicle of Trier (Gesta Treverorum, ed. Waitz in Mon. Germ. Hist. ; script., VIII, 111-174) in which there is a curious mixture of truth and error. It contains the account of the life of St. Eucharius given above. An amplification thereof, containing the lives of the three saints in question, is said to have been written by the monk Goldscher or Golscher, who lived in that monastery about the year 1130. From the "Gesta" the narrative passed unchallenged into numerous medieval works. Later criticism has detected many contradictions and inaccuracies in these ancient records, and it is almost universally believed at present that, with few exceptions, the first Christian missionaries came to Gaul, to which Trier then belonged, not earlier than about 250. Following Hontheim, Calmet and others, the Bollandists, with Marx, Lütolf, and other historians refer these holy bishops of Trier to a period following 250, though not all of them consider this as fully established. Saint Juan Diego Cuauhtlatoatzin (1474 – May 30, 1548) was an indigenous Mexican who reported an apparition of the Virgin Mary as Our Lady of Guadalupe in 1531. He had a significant impact on the spread of the Catholic faith within Mexico. The Roman Catholic Church canonized him in 2002, as its first indigenous American saint. Juan Diego was born in 1474 in the calpulli of Tlayacac in Cuauhtitlán, a small Indian village some 20 km (12 mi) to the north of Tenochtitlan (Mexico City). His original or birth name was Cuauhtlatoatzin (alternately rendered as Quauhtatoatzin, Guauhtlatoatzin, or Cuatliztactzin), which has been translated as "Talking Eagle" in the Nahuatl language. Not much is known about Juan Diego’s family life; but he did not have any children with his wife. A farmer, landowner and weaver of mats, he witnessed the Spanish conquest of Mexico by Hernán Cortés in 1521, when he was 47 years old. Following the invasion, in 1524, the first 12 Franciscan missionaries arrived in what is now Mexico City. Cuauhtlatoatzin and his wife welcomed the Franciscans in 1524 or 1525 and were among the first to be baptized — he taking the Christian name of Juan Diego; she, Maria Lucia. Later, they moved to Tolpetlac to be closer to Tenochtitlan (Mexico City) and the Catholic mission that had been set up by the Franciscan friars. According to his legend, after hearing a sermon on the virtue of chastity, they reportedly decided to live chaste lives. This decision was later cited as a possible reason for which the Virgin Mary chose to appear to Juan Diego. In 1529, a few years after her baptism, Maria Lucia became sick and died. As a widower, Juan Diego was prone to long periods of silence. He walked every Saturday and Sunday to church, and on cold mornings, like other members of his Indian tribe, wore a woven cloth called a tilma, or ayate made with coarse fibers from the maguey cactus for cotton was only used by the upper class Aztec. On Saturday morning, December 9, 1531, he reported the following: As he was walking to church, he heard the sound of birds singing on Tepeyac hill and someone calling his name. He ran up the hill, and saw a Lady, dressed like an Aztec princess. The Lady spoke to him in Nahuatl, his native tongue. She called him “Xocoyte,” her little son. Recognizing the Lady as the Virgin Mary, Juan Diego went to the bishop as instructed, but the Spanish bishop, Fray Juan de Zumárraga was doubtful and told Juan Diego he needed a sign. The Lady promised Juan Diego she would give him a sign the following day. According to Juan Diego, he returned home that night to his uncle Juan Bernardino’s house, and discovered him seriously ill. The next morning December 12, Juan Diego decided not to meet with the Lady, but to find a priest who could administer the last rites to his dying uncle. When he tried to skirt around Tepeyac hill, the Lady stopped him, assured him his uncle would not die, and asked him to climb the hill and gather flowers. It was December, when normally nothing blooms in the cold. There he found roses from the region of Castille in Spain, former home of bishop Zumárraga. The Lady placed the roses carefully inside the folded tilma that Juan Diego wore and told him not to open it before anyone but the bishop. When Juan Diego unfolded his tilma before the Bishop roses cascaded from his tilma, and icon of Our Lady of Guadalupe was miraculously impressed on the cloth, bringing the bishop to his knees. Eulalia of Mérida was a Roman Christian child martyred in Emerita in Lusitania (modern Mérida in Spain) during the persecution of Christians in the reign of emperor Diocletian and his co-emperor Maximian. Others place her death at the time of Trajan Decius (AD 249-51). There is some dispute as to whether Saint Eulalia of Barcelona,whose story is similar, is the same person. She was then stripped by the soldiers, tortured with hooks and torches, and burnt at the stake, suffocating from smoke inhalation. She taunted her torturers all the while, and as she expired a dove flew out of her mouth. This frightened away the soldiers and allowed a miraculous snow to cover her nakedness, its whiteness indicating her sainthood. A shrine over her tomb was soon erected. Veneration of Eulalia was already popular with Christians by AD 350 and relics from her were distributed through Iberia. Bishop Fidelis of Merida rebuilt a basilica in her honour around AD 560. Her shrine was the most popular in Visigothic Spain. In c. 780 her body was transferred to Oviedo by King Silo. It lies in a coffin of Arab silver donated by Afonso VI in 1075. He was probably born near the city of Idanha-a-Nova (in Lusitania, Hispania), in what is present-day Portugal, or near the city of Guimarães (in what is present-day Portugal), in Gallaecia (now Galicia, Spain). Damasus I is known to have been raised in the service of the church of the martyr St. Laurence in Rome, and following the death of Pope Liberius, he succeeded to the Papacy amidst factional violence. A group of Damasus' supporters, previously loyal to the Antipope Felix II, attacked and killed rivals loyal to Liberius' deacon Ursinus, in a riot that required the intervention of Emperor Valentinian I to quell. Damasus faced accusations of murder and adultery in his early years as pope. The neutrality of these claims have come into question with some suggesting that the accusations were motivated by the schismatic conflict with the supporters of Arianism. His personal problems were contrasted with his religious accomplishments, which included restoring the Basilica di San Lorenzo fuori le Mura, appointing the later-Saint Jerome as his personal secretary, creating (through Jerome) a standard Latin translation of the Bible, known as the Vulgate, that replaced existing Vetus Latina, and translated from the original Hebrew instead of the Greek Septuagint, and presiding over the Council of Rome in 382, at which, according to Roman Catholic tradition and the 6th century document Decretum Gelasianum, the modern Catholic canon of scripture was first set down. Damasus' parents were Antonius, a priest at the Church of San Lorenzo in Rome, and Laurentia. When Pope Liberius was banished by Emperor Constantius II to Beraea, in 354, Damasus was arch-deacon of the Roman church and followed Liberius into exile, though he immediately returned to Rome. During the period before Liberius' return, Damasus had a great share in the government of the church. In the early Church, new Bishops of Rome were elected or chosen by the clergy and the people of the diocese in the presence of the other bishops in the province, which was the manner customarily used in other dioceses. On the death of Liberius, September 24, 366, one faction supported Ursinus, while the other faction supported Damasus. This dissension climaxed with a riot which led to a three-day massacre. Damasus prevailed, but only with the support of the city prefect. Once he was securely consecrated bishop of Rome, his men attacked Ursinus and his remaining supporters, resulting in a massacre of one hundred and thirty seven supporters of Ursinus. Many in both Pagan and Christian society saw in Damasus a man whose worldly ambitions outweighed his pastoral concerns. Damasus I was active in defending the Roman Church against the threat of schisms. In two Roman synods (368 and 369) he condemned Apollinarianism and Macedonianism, and sent legates to the First Council of Constantinople that was convoked in 381 to address these heresies. Damasus also contributed greatly to the liturgical and aesthetic enrichment of the city churches. His ceremonial embellishments and the emphasis on the Roman legacy of Peter and Paul amounted to a general claim to the Roman upper classes that the real glory of Rome was Christian and not pagan. The reign of Gratian, during Damasus' papacy, forms an important epoch in ecclesiastical history, since during that period (359-383), Orthodox Christianity, for the first time became dominant throughout the empire. St Finnian of Clonard ('Cluain Eraird') (470 - 549) was one of the Twelve Apostles of Ireland. He founded Clonard Abbey in modern-day County Meath. He might have been born at Myshall, County Carlow. At an early age he was supposedly placed under the care of St. Fortchern, by whose direction, it is said, he proceeded to Wales to perfect himself in holiness and sacred knowledge under the great saints of that country. After a long sojourn there, of thirty years according to the Salamanca MS., he returned to his native land and went about from place to place, preaching, teaching, and founding churches, until he was at last led by an angel to Cluain Eraird, which he was told would be the place of his resurrection. Here he built a little cell and a church of clay and wattle, which after some time gave way to a substantial stone structure, and entered on a life of study, mortification, and prayer. The fame of his learning and sanctity was soon noised abroad, and scholars of all ages flocked from every side to his monastic retreat -- young laymen and clerics, abbots, and bishops. In the Office of St. Finnian it is stated that there were no fewer than 3000 pupils getting instruction at one time in the school in the green fields of Clonard under the broad canopy of heaven. The master excelled in exposition of the Sacred Scriptures, and to this fact must be mainly attributed the extraordinary popularity which his lectures enjoyed. The exact date of the saint's death is uncertain, but it was probably 552, and his burial-place is in his own church of Clonard. For centuries after his death the school continued to be renowned as a seat of Scriptural learning, but it suffered at the hands of the Danes, especially in the eleventh century, and two wretched Irishmen, O'Rorke of Breifney and Dermod McMurrough, helped to complete the unholy work which the Northmen had begun. With the transference by the Norman Bishop of Rochfort, in 1206, of the See of Meath from Clonard to Trim, the glory of the former place departed forever. Saint Lucy of Syracuse, also known as Saint Lucia, Santa Lucia, or Saint Lukia, (traditional dates 283-304) was a rich young Christian martyr who is venerated as a Saint by Catholic and Orthodox Christians. Her feast day in the West is December 13, by the unreformed Julian calendar the longest night of the year; she is the patron saint of blindness. Lucy is one of the very few saints celebrated by the Lutheran Swedes, Finland-Swedes, Danes, and Norwegians, in celebrations that retain many indigenous Germanic pagan pre-Christian midwinter light festivals. She is one of seven women, excluding the Blessed Virgin Mary, commemorated by name in the Canon of the Mass. Her actae tell that Lucy (whose name means "light") was a Christian while Diocletian was persecuting and martyring Christians. She consecrated her virginity to God, refused to marry a pagan, and had her dowry distributed to the poor. Her would-be husband denounced her as a Christian to the governor of Syracuse. Miraculously unable to move her or burn her, the guards stabbed her and killed her. Lucy means "light", with the same Latin root, lux, as "lucid," which means "clear, radiant, understandable." Ironically, St Lucy's history is shrouded in darkness: all that is really known for certain is that she was a martyr in Syracuse in Diocletian's persecutions of A.D. 304. Her veneration spread to Rome, so that by the 6th century the whole Church recognized her courage in defense of the faith. Because people wanted to shed light on Lucy's bravery, legends grew up, reported in the acta that are associated with her name. All the details are conventional ones also associated with other female martyrs of the early 4th century. Her Roman father died when she was young, leaving her and her mother without a protecting guardian. Her mother, Eutychia, had suffered four years with a "bloody flux" but Lucy having heard the renown of Saint Agatha the patroness of Catania, "and when they were at a Mass, one read a gospel which made mention of a woman which was healed of the bloody flux by touching of the hem of the coat of Jesus Christ," which, according to Legenda Aurea, convinced her mother to pray together at Saint Agatha's tomb. They stayed up all night praying, until they fell asleep, exhausted. Saint Agatha appeared in a vision to Lucy and said, "Soon you shall be the glory of Syracuse, as I am of Catania." At that instant Eutychia was cured. Eutychia had arranged a marriage for Lucy with a pagan bridegroom, but Lucy urged that the dowry be spent on alms so that she might retain her virginity. Euthychia suggested that the sums would make a good bequest, but Lucy countered, "...whatever you give away at death for the Lord's sake you give because you cannot take it with you. Give now to the true Savior, while you are healthy, whatever you intended to give away at your death." News that the patrimony and jewels were being distributed came to the ears of Lucy's betrothed, who heard from a chattering nurse that Lucy had found a nobler Bridegroom. Her rejected pagan bridegroom denounced Lucy as a Christian to the magistrate Paschasius, who ordered her to burn a sacrifice to the Emperor's image. The Christian tradition states that when the guards came to take her away they found her so filled with the Holy Spirit that she was stiff and heavy as a mountain; they could not move her even when they hitched her to a team of oxen. Even with a dagger through her throat she prophesied against her persecutor. As final torture, her eyes were gouged out. She was miraculously still able to see without her eyes. Prayer: Relying on Your goodness, O God, we humbly ask You, through the intercession of Saint Lucy, Virgin and Martyr, to give perfect vision to our eyes, that they may serve for Your greater honor and glory. Saint Lucy, hear our prayers and obtain our petitions. Amen. Saint John of the Cross (San Juan de la Cruz) (June 24, 1542 – December 14, 1591) was a major figure in the Catholic Reformation, a Spanish mystic and Carmelite friar and priest born at Fontiveros, a small village near Ávila. He is renowned for his cooperation with Saint Teresa of Ávila in the reformation of the Carmelite order, and for his writings; both his poetry and his studies on the growth of the soul (in the Christian sense of detachment from creatures and attachment to God) are considered the summit of mystical Spanish literature and one of the peaks of all Spanish literature. He is one of the thirty-three Doctors of the Church. On February 24, 1563 he entered the Carmel order, adopting the name Fr. Juan de Santo Matía. The following year (1564) he professed as a Carmelite and moved to Salamanca, where he studied philosophy at the University and at the Colegio de San Andrés. John was ordained a priest in 1567, and then indicated his intent to join the strict Carthusian order, which appealed to him because of its encouragement of solitary and silent contemplation. Before this, however, he travelled to Medina del Campo, where he met the charismatic Saint Teresa de Jesús. She immediately talked to him about her reformation projects for the Carmelite order, and asked him to delay his entry into the Carthusians. The following year, on 28 November, he started this reformation at Duruelo together with Fr. Antonio de Jesús de Heredia. The followers of St. John and St. Teresa differentiated themselves from the non-reformed communities by calling themselves the "discalced", i.e. barefoot, and the others the "calced" Carmelites. On the night of 3–4 December 1577, following his refusal to relocate after his superior's orders, he was taken prisoner by his superiors, and jailed in Toledo. He managed to escape nine months after, on 15 August 1578. In the meantime, he had composed a great part of his most famous poem Spiritual Canticle during this imprisonment. After returning to a normal life, he went on with the reformation and the founding of monasteries for the new Discalced Carmelite order. He died on 14 December 1591, his writings were first published in 1618. Saint Nino (Georgian: წმინდა ნინო, Greek: Άγιη Νίνω),(sometimes Nina or Ninny) Equal to the Apostles and the Enlightener of Georgia, (c. 296 – c. 338 or 340) was a woman who preached and introduced Christianity in Georgia. According to most widely traditional accounts, she was from Kolastra, Cappadocia (Greek: Καππαδοκία), was a relative of Saint George, and came to Georgia (ancient Iberia) from Constantinople. Other sources claim she was from Rome, Jerusalem or Gaul (modern France). She performed miraculous healings and converted the Georgian queen, Nana, and eventually the pagan king Mirian III of Iberia, who, lost in darkness and blinded on a hunting trip, found his way only after he prayed to “Nino’s God”. Mirian declared Christianity an official religion (c. 327) and Nino continued her missionary activities among Georgians until her death. Many sources agree that Nino was born in the small town of Colastri, in the Roman province of Cappadocia. On her family and origin, the Roman Catholic Church and the Eastern Orthodox Church have different traditions. According to the Eastern Orthodox Church tradition, she was the only child of the famous Roman general Zabulon. On her father's side, Nino was related to St. George, and on her mother's, to the Patriarch of Jerusalem, Houbnal I. During her childhood Nino was brought up by her relative and the nun named Sarah Bethlehemlianka. Nino’s uncle who served as the Patriarch of Jerusalem oversaw her traditional upbringing. Nino went to Rome with the help of her uncle where she decided to preach the Christian gospel in Iberia, known to her as the resting place of the Christ’s tunic. According to the legend, Nino received a vision where the Virgin Mary gave her a grapevine cross and ordered her to go to Iberia. While on her way to Iberia, passing through Anatolia into Caucasus, Nino managed to convert some villages to Christianity in Northern Anatolia and Armenia. Contrasting with this, the Roman Catholic tradition says Nino was brought to Iberia not fully from her own intent, but as a slave, and that her family tree is obscure. Nino reached the borders of ancient Georgian Kingdom of Iberia in about 320 A.D. There, she placed a Christian cross in the small town of Akhalkalaki and started preaching the Christian faith in Urbnis and finally reaching Mtskheta (the capital of Iberia). Iberian Kingdom has been influenced by the neighbouring Persian Empire which played an important role as the regional power in the Caucasus. The Iberian King Mirian III and his nation worshiped the syncretic gods of Armazi and Zaden. Queen Nana, who suffered from severe illness, had some knowledge of Christianity but not yet converted to it. Nino having restored her health, won to herself disciples from the Queen's attendants, including a Jewish priest and his daughter, Abiathar and Sidonia. Queen officially converted to Christianity and was baptized by Nino herself. According to the legend, while on the hunting trip, the King was suddenly struck blind as the total darkness emerged in the woods. In a desperate state, King Mirian uttered the prayer to the God of St Nino: If indeed that Christ whom the Captive had preached to his Wife was God, then let Him now deliver him from this darkness, that he too might forsake all other gods to worship Him. As soon as he finished his prayer, the light appeared and the King hastily returned to his palace in Mtskheta. As the results of this miracle, the King of Iberia renounced idolatry under the teaching of St Nino and was baptized as the first Christian King of Iberia. Soon whole of his household and the inhabitants of Mtskheta adopted Christianity. In 327 A.D King Mirian made Christianity as the state religion of his kingdom, making Iberia the second Christian state after Armenia. Nino, having witnessed the conversion of Iberia to Christianity, withdrew to the mountain pass in Bodbe, Kakheti and died soon after. Saint Adelaide (931 – 16 December 999) was perhaps the most prominent European woman of the 10th century. She was the daughter of Rudolf II of Burgundy and Bertha of Swabia. Her first marriage, at the age of fifteen, was to the son of her father's rival in Italy, Lothair II, the nominal King of Italy; the union was part of a political settlement designed to conclude a peace between her father and Hugh of Provence, the father of Lothair. They had a daughter, Emma of Italy. The Calendar of Saints states that her first husband was poisoned by the holder of real power, his successor, Berengar of Ivrea, who attempted to cement his political power by forcing her to marry his son, Adalbert; when she refused and fled, she was tracked down and imprisoned for four months at Como. She escaped to the protection, at Canossa, of Adalbert Atto, where she was besieged by Berengar. She managed to send an emissary to throw herself on the mercy of Otto the Great of Germany. His brothers were equally willing to save the heiress of Italy, but Otto got an army into the field: they subsequently met at the old Lombard capital of Pavia and were married in 951; he was crowned Emperor in Rome, 2 February 962 by Pope John XII, and, most unusually, she was crowned Empress at the same ceremony. Among their children, four lived to maturity: Henry, born in 952; Bruno, born 953; Matilda, Abbess of Quedlinburg, born about 954; and Otto II, later Holy Roman Emperor, born 955. In Germany, the crushing of a revolt in 953 by Liudolf, Otto's son by his first marriage, cemented the position of Adelaide, who retained all her dower lands. She accompanied Otto in 966 on his third expedition to Italy, where she remained with him for six years. When her husband Otto I died in 973 he was succeeded by their son Otto II, and Adelaide for some years exercised a powerful influence at court. Later, however, her daughter-in-law, the Byzantine princess Theophano, turned her husband Otto II against his mother, and she was driven from court in 978; she lived partly in Italy, and partly with her brother Conrad, king of Burgundy, by whose mediation she was ultimately reconciled to her son; in 983 Otto appointed her his viceroy in Italy. However, Otto died the same year, and although both mother and grandmother were appointed as co-regents for the child-king, Otto III, Theophano forced Adelaide to abdicate and exiled her. When Theophano died in 991, Adelaide was restored to the regency of her grandson. She was assisted by Willigis, bishop of Mainz. In 995 Otto III came of age, and Adelaide was free to devote herself exclusively to works of charity, notably the foundation or restoration of religious houses. Adelaide had long entertained close relations with Cluny, then the center of the movement for ecclesiastical reform, and in particular with its abbots Majolus and Odilo. She retired to a monastery she had founded in c. 991 at Selz in Alsace. Though she never became a nun, she spent the rest of her days there in prayer. On her way to Burgundy to support her nephew Rudolf III against a rebellion, she died at Selz Abbey on December 16, 999, days short of the millennium she thought would bring the Second Coming of Christ. She had constantly devoted herself to the service of the church and peace, and to the empire as guardian of both; she also interested herself in the conversion of the Slavs. She was thus a principal agent—almost an embodiment—of the work of the Roman Catholic Church during the Early Middle Ages in the construction of the religion-culture of western Europe. Lazarus is the name of two separate people mentioned in the New Testament. The more famous one is the subject of the miracle recounted only in John, in which Jesus raises him from the dead. 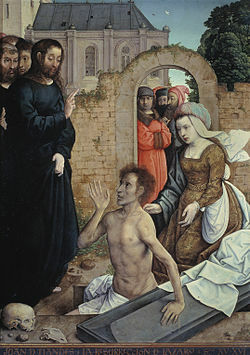 The other appears uniquely in Jesus' parable of Lazarus and Dives. In the Gospel of Luke 16:19–31, Lazarus is a beggar who lay outside the gate of a rich man, whom later tradition has given the name Dives, who dressed in fine clothing and dined sumptuously every day, but gave nothing to Lazarus. Both men died, and the beggar received his reward in the Hereafter, in Abraham's bosom at the everlasting banquet, while the rich man craved a drop of water from Lazarus' finger to cool his tongue as he was tormented in the fires of Hell. In the Gospel of John, Lazarus, also called Lazarus of Bethany or Lazarus of the Four Days, was a man who lived in the town of Bethany. Jesus came to Bethany and found that Lazarus had been in the tomb for four days. In the presence of a crowd of Jewish mourners, Jesus had the stone rolled away from the tomb and bade Lazarus to come out, and so he did, still wrapped in his grave-cloths. Jesus then called for his followers (friends and family alike) to remove the grave-cloths. The narrator claims many other Jews were convinced of Jesus' divinity after visiting Lazarus, but says no more of the individual. The 13th century Golden Legend claims that Lazarus fled to Cyprus, where he became the first bishop of Larnaka/Kittim, appointed directly by Paul and Barnabas. It was claimed that the bishop's pallium was presented to Lazarus by the Virgin Mary, who had woven it herself. Such apostolic connections were central to the claims to autocephaly made by the bishops of Kittim—subject to the patriarch of Jerusalem—during the period 325–413. Lazarus the beggar and Lazarus the resurrected were combined in Romanesque iconography carved on portals in Burgundy and Provence. Gatianus or Saint Gatien (3rd century CE) was the founding bishop of the see of Tours. During the consulship of the Emperor Decius and Vettus Gratus (250 CE), Pope Fabian sent out seven bishops from Rome to Gaul to preach the Gospel: Gatianus to Tours, Trophimus to Arles, Paul to Narbonne, Saturnin to Toulouse, Denis to Paris, Austromoine to Clermont, and Martial to Limoges. A community of Christians had already existed for many years in Lyon, where Irenaeus had been bishop. Gatianus devoted half a century to evangelization, against the objections of the Gauls. According to the Catholic Encyclopedia, he managed anyway to gather apostles round him, whom he sent out to establish churches, and at his death the diocese of Tours was securely established. As with other founders of the seven Catholic churches of Gaul, especially Martial, Gatianus became confounded in later Christian mythology with the "seventy-two disciples of Christ", alleged to have been sent into Gaul during the first century, by Saint Peter himself. Other details of his biography are largely legendary. Gregory of Tours, writing in the 6th century, is a more dependable source for the few biographical details concerning his predecessor. According to the Catholic historian Mons. Louis Duchesne (Christian Worship: Its Origin and Evolution), the traditions preserved at Tours furnished Gregory with only the name of Gatianus and perhaps the 50-year extent of his episcopacy; it was by comparison with a brief early biography of Saturninus of Toulouse (Passio S. Saturnini) that Gregory arrived at the date 250, for the beginning of Gatianus' ministry at Tours (History of the Franks, 1.30). Gatianus established a hospice for the poor outside the walls of Tours. There, according to Abbé Jaud, the Saviour appeared to him, saying, "Fear not! Thy crown is readied and the Saints await thy arrival in Heaven." With that, the Saviour administered Holy Communion and the Last Rites himself. After Gatianus' death, during renewed persecution of Christians, the see of Tours remained unoccupied for 36 years, the Christians were dispersed, and any direct connection with the historical Gatianus was irretrievably broken. Gregory records the second bishop as Lidorius, traditionally credited with building the predecessor of the present cathedral in Tours (10.31), and states that he was bishop for 33 years, until about the time Saint Martin arrived in Tours in 371 CE. However, Martin found few Christians in this city; local lore nevertheless kept the legend of Gatianus alive. Martin found Gatianus' burial site, and always venerated his predecessor. With the rise in importance of Paris, Gatianus came to be seen more and more as a disciple of Saint Denis, and is so described at many modern Catholic websites. Blessed Pope Urban V (1310 – December 19, 1370), born Guillaume Grimoard, was Pope from 1362 to 1370. He was a native of Grizac in Languedoc (today part of the commune of Le Pont-de-Montvert, département of Lozère). He became a Benedictine and a doctor in Canon Law, teaching at Montpellier and Avignon. He held the office of abbot of Saint-Victor in Marseille; and at Avignon, on his way back from Naples, whither he had been sent as papal legate, he was elected Pope Urban V (September 28, 1362) in succession to Pope Innocent VI (1352–62). As Pope he was a severe disciplinarian, discountenanced the pomp and luxury of the cardinals, introduced considerable reforms in the administration of justice, and liberally patronised learning. He founded the University of Hungary. In Toulouse, he saved the university of music. In Montpellier, he restored the school of medicine and founded the college of Saint Benoit whose church became a cathedral decorated with numerous works of art. He founded a college in Quézac and Bédouès, and a church and library in Ispagnac. He supported more than 1,000 students of all classes with food and lodging. Even during war they were nourished well. He provided them with books and the best professors. His pontificate witnessed one of the last flickers of crusading zeal in the expedition of Peter I of Cyprus, who took Alexandria on (October 11, 1365), but soon afterwards abandoned it. He enforced a crusade against the Turks to take back Alexandria. He also sent many missions to Bosnia, Lithuania, Bulgaria and China. The great feature of Urban V's reign was the effort to restore the Papacy to Italy, and to suppress its powerful rivals for the temporal sovereignty there. In 1363 he excommunicated Bernabò Visconti, the last great figure of Ghibellinism in northern Italy, which occupied the Papal city of Bologna and valiantly resisted the troops of Gil de Albornoz, the Papal vicar in Italy at the time. Urban ordered a crusade to be preached throughout Italy against him and his kindred, accused to be robbers of the church's estate; but in the march of following year he found it necessary to purchase peace: through the mediation of Emperor Charles IV, he removed his ban against Visconti, obtaining Bologna only after a grievous payment. Around Rome, he also planted vine-yards. Continued troubles in Italy, as well as pleas from figures such as Petrarch and St. Bridget of Sweden, caused Urban V to set out for Rome, which he reached on October 16, 1367. However, although greeted by the clergy and people with joy, and despite the satisfaction of being attended by the Emperor in St. Peter's, and of placing the crown upon the head of the Empress, it soon became clear that by changing the seat of his government he had not increased its power. In Rome he was otherwise able to receive the homage of the king of Cyprus, Queen Joan I of Naples and the Byzantine emperor John V Palaeologus, and coronated Charles IV as Holy Roman Emperor. Unable any longer to resist the urgency of the French cardinals, and with numerous cities of the Papal States in revolt, he took ship again at Corneto on September 5, 1370, arriving at Avignon on the 24th of the same month. A few days later he fell ill, and died on December 19. He was succeeded by Pope Gregory XI (1370–78). His canonization was demanded by Valdemar IV of Denmark and promised by Pope Gregory XI as early as in 1375, but did not take place owing to the disorders of the time. Urban V's cultus was approved by Pope Pius IX (1846–78) in 1870. Saint Dominic of Silos (Santo Domingo de Silos) (1000—December 10, 1073) is a Spanish saint, to whom the Monastery of Santo Domingo de Silos is dedicated. Born in Cañas, La Riojain the kingdom of Navarre (today part of Spain), on the Spanish side of the Pyrenees, , to a family of peasants, he worked as a shepherd before becoming a Benedictine monk at the monastery of San Millán de Cogolla. As a young boy he spent time in the fields, where he welcomed the solitude. He became novice master and then prior there before being driven out with two of his fellow monks by the king of Navarre, who wished to annex the monastery's lands. Under the protection of Ferdinand I of León, king of Castille, they found refuge at the monastery later named after him, the San Sebastian monastery at Silos, diocese of Burgos where Dominic was appointed abbot. Founded in 954, the monastery had fallen on hard times. There were only six monks left and the monastery was in terrible shape physically, financially and spiritually. There Dominic rebuilt the monastery, both spiritually and physically, and turned it into a center of book design, gold and silver work, scholarship, and charity. The monastery became one of the centers of the Mozarabic liturgy, a special form of the Roman rite, and also preserved the Visigothic script of ancient Spain. Wealthy patrons endowed the monastery, and Dominic raised funds to ransom Christians taken prisoner by the Moors. He died of natural causes in 1073. Dominic's relics were translated to the monastery church at Silos on January 5, 1076. Churches and monasteries were dedicated to him as early as 1085. His special patronage was connected with pregnancy, and before 1931, his abbatial staff was used to bless Spanish queens and kept by their beds when they were in labor. The mother of Saint Dominic of Guzmán is said to have prayed at the shrine of Dominic of Silos before she conceived the child that would subsequently found the Dominican Order. Attributes: abbot surrounded by the Seven Virtues; mitred abbot enthroned with a book, a veil tied to his crozier. Saint Petrus Canisius (May 8, 1521 – December 21, 1597) was an important Jesuit who fought against the spread of Protestantism in Germany, Austria, Bohemia, and Switzerland. The restoration of Catholicism in Germany after the Reformation is attributed to his work. St. Peter became canonized and declared a Doctor of the Church in 1925. His feast day in the Roman Catholic Church is April 27 or December 21. He was born Peter Kanis in the Duchy of Guelders (until 1549 part of the Holy Roman Empire, now in the Netherlands). In the University of Cologne, he met Peter Faber, one of the founders of the Society of Jesus. Canisius became the first Dutchman to join the Jesuit order in 1543. Through his work in the order he became one of the most influential Catholics of his time. He supervised the founding and maintenance of the early German Jesuit Colleges, often with little resources at hand. Because of his frequent travels between the colleges, a tedious and dangerous occupation at the time, he became known as the Second Apostle of Germany. Canisius also exerted a strong influence on Emperor Ferdinand I; he tirelessly reminded Ferdinand of the imminent danger to his soul should he cede more rights to Protestants in return for military support. And when Canisius perceived a strong danger of Ferdinand's son and heir, King Maximilian, openly declaring himself Protestant, he convinced Ferdinand to threaten disinheritance should Maximilian desert the Catholic Faith. By the time he left Germany in 1590, the Jesuit order in Germany had evolved from almost nothing into a powerful tool of the Counter Reformation. Canisius spent the last 20 years of his life in Fribourg, Switzerland, where he founded the Jesuit College that became the core of today's University of Fribourg. In recognition of his early work in the establishment of Jesuit education, there are multiple educational institutions named for Canisius. Among them is Canisius College, a Jesuit secondary school in his hometown of Nijmegen and the alma mater of Peter Hans Kolvenbach, the current Superior General of the Jesuit order. Another Canisius College, a post-secondary school, and Canisius High School, a secondary school, are located in Buffalo, New York. Furthermore, a Jesuit-run Canisius Kolleg can be found in Berlin, Germany. There is also a secondary or post-secondary complex of schools named for Canisius, Kolese Kanisius (Collegium Canisianum or Canisius College), on Jakarta, Indonesia. In 1850 they also founded the Canisius Hospital on the corner of the Houtmarkt and the Pauwelstraat in Nijmegen. In 1974 it has merged in to the Canisius Wilhelmina Hospital located at the Weg door Jonkerbos in Nijmegen. The 'Apologetische Vereniging St. Petrus Canisius' (apologetic association Petrus Canisius) was founded in the Netherlands in 1904. The purpose of this association was the defense of the Roman Catholic Church against new values of socialism and liberalism and the restoration of the society with a more Catholic way of life. Saint Frances Xavier Cabrini (July 15, 1850 – December 22, 1917) known during her life as Mother Cabrini, was the first American citizen to be canonized by the Roman Catholic Church. She was born Maria Francesca Cabrini in Sant'Angelo Lodigiano, in Lombardy, the youngest of thirteen children of Agostino Cabrini and Stella Oldini. At 13, she was sent to Arluno to study under the Daughters of the Sacred Heart, and at 18 she was certified as a teacher. She took religious vows in 1877, becoming the mother superior of the House of Providence orphanage in Codogno, where she was teaching. In 1880, the orphanage was closed and she became one of the seven founding members of the Institute of the Missionary Sisters of the Sacred Heart of Jesus (MSC). Mother Cabrini composed the rules and constitution of the order, and she continued as its superior-general until her death. The order established seven homes and a free school and nursery in its first five years. Its good works brought Mother Cabrini to the attention of Bishop Giovanni Scalabrini of Piacenza and of Pope Leo XIII. Although her lifelong dream was to be a missionary in China, the Pope sent her to New York City on March 31, 1889. There, she obtained the permission of Archbishop Michael Corrigan to found an orphanage, which is located in West Park, Ulster County, NY today and is known as Saint Cabrini Home, the first of 67 institutions she founded. Mother Cabrini died of complications from malaria at Columbus Hospital in Chicago. Though originally entombed in West Park, NY after her death on December 22, 1917, her remains were exhumed from West Park in 1931 and are now enshrined on display under glass in the church's altar at St. Frances Cabrini Shrine. The Cabrini Mission Foundation is an organization committed to advancing St. Frances Xavier Cabrini's mission and legacy of healing, teaching, and caring around the world. Saint John Cantius (Polish: Jan Kanty; 23 June 1390 – 24 December 1473) was a renowned Polish Scholastic and theologian. In English he is also known as John of Kanty or John of Kenti. He was born in Kęty, a small town near Oświęcim, in the diocese of Kraków, Poland, to Stanisław and Anna Kanty. His parents enrolled him in the Kraków Academy, where he eventually graduated as a bachelor, master, and doctor. He was also ordained a priest. Though he left the Academy for a time after his graduation, he soon returned as professor of Sacrae Scripturae (Sacred Scriptures), a position he held until his death in 1473. In physics, he helped develop Jean Buridan's theory of "impetus," which anticipated the work of Galileo and Newton. In 1431 he was transferred to the small village of Olkusz in Bohemia. John had been unjustly kicked out of his university position because of false charges, presented by rivals who resented John's popularity. Eight years later he was exonerated and transferred back to Cracow to be a professor of sacred Scripture at the university. Cantius was noted throughout his life for his good humor and humility. He subsisted only on what was strictly necessary to sustain his life, giving away the rest of his salary to the poor. He made four pilgrimages to Rome (on foot), and one to Jerusalem—the latter with the intent of martyring himself to the Turks. Throughout his life, various miracles were attributed to him. In 1767 he was canonized by Pope Clement XIII. A popular saint in Poland, a number of churches founded by Polish diaspora communities throughout North America in cities such as Winnipeg, Detroit, Buffalo, Chicago and New York City are named in his honor. Saint Irmina(c. 660 - c. 708) and Saint Adela (? - 735) were mother and daughter. For eight centuries, Saint Irmina was said to be the daughter of king Dagobert II. Newer research discovered this to be pure fiction. Irmina was of noble birth, but her true parents are not known. Irmina was married to Hugobert of Ören, a senechall and count palatinate. Together, they had five children, Plektrudis, Saint Adela, Reginlind, the wife of duke Theodbert of Bavaria, Chrodelind and Bertrada, the great grandmother of Charlemagne. After the death of her Husband she became a Benedictine nun of the convent at Örren in Trier, founded by bishop Modoald. Soon she became the second abbess. When a plague threatened her community, she gained the help of Saint Willibrord. When the pestilence passed by the convent, she gave Willibrord lands along the river Sure, where he founded his abbey of Echternach. Her daughter, Saint Adela, was married to Odo, a vir illuster. Her husband died within a few years of the marriage. Despite multiple marriage offers, she chose to take up holy orders as well. She founded the convent of Palatiolum in lands that were then undeveloped outside of Trier. The site later developed into the town of Pfalzel. She was the first abbess of this convent and died on December 24, 735. She had three children. Saint Anastasia (Greek Ἀναστασία: "resurrection", often Ἁγία Ἀναστασία ἡ Φαρμακολύτρια, "St. Anastasia the Healer" ) was a Christian saint and martyr who died at Sirmium. Concerning Anastasia little is reliably known, save that she died in the persecutions of Diocletian; most stories about her date from several centuries after her death and make her variously a Roman or Sirmian native and a Roman citizen of patrician rank. One legend makes her the daughter of a certain Praetextus and the pupil of Saint Chrysogonus. Anastasia has long been venerated as a healer and exorcist. Her remains lie in the Cathedral of St. Anastasia in Zadar, Croatia. She is one of seven women, excluding the Blessed Virgin, commemorated by name in the Canon of the Mass. This martyr enjoys the distinction, unique in the Roman liturgy, of having a special commemoration in the second Mass on Christmas day. This Mass was originally celebrated not in honour of the birth of Christ, but in commemoration of this martyr, and towards the end of the fifth century her name was also inserted in the Roman canon of the Mass. Nevertheless, she is not a Roman saint, for she suffered martyrdom at Sirmium, and was not venerated at Rome until almost the end of the fifth century. It is true that a later legend, not earlier than the sixth century, makes Anastasia a Roman, though even in this legend she did not suffer martyrdom at Rome. The same legend connects her name with that of St. Chrysogonus, likewise not a Roman martyr, but put to death in Aquileia, though he had a church in Rome dedicated to his honour. Saint Stephen (Greek: Στέφανος Stephanos), known as the Protomartyr (Greek: Πρωτομάρτυρας Protomartyras) (or first martyr) of Christianity, is venerated as a saint in the Roman Catholic Church, as well as in the Orthodox Church. His name means 'laurel wreath' or 'crown' in Greek. (This role came to be known as deacon.) Stephen was also recognized for his gifts as an evangelist, preaching the teachings of Jesus to the people of Jerusalem, including members of the place of the Hellenistic synagogues. According to the Acts of the Apostles, during the early time frame of the Christian church in Jerusalem, Stephen was one of seven men, probably Hellenistic Jews, chosen to attend to the distribution of aid to elderly widows within the church community. (This role came to be known as deacon.) Stephen was also recognized for his gifts as an evangelist, preaching the teachings of Jesus to the people of Jerusalem, including members of the place of the Hellenistic synagogues. Prayer: Dear Saint Stephen first deacon and martyr, you are the patron saint and model for all deacons. You gave your life unafraid, valiantly speaking the truth you forgave those who were you persecutors. With love we mold our lives after yours. May we gain courage and strength from the wisdom and faith that you possessed as gifted by the Holy Spirit. Intercede for us, oh powerful Saint Stephen, that we may quietly reach out to the poor and the lonely, not seeking recognition for ourselves, but to honor the name of our Lord Jesus, the Savior. You who had the face of an angel guide our path - we ask all of this through the prayer of our Lord Jesus, the Christ. Amen. John the Apostle (Greek Ιωάννης, see names of John) was one of the Twelve Apostles of Jesus. Christian tradition identifies him with the authors of several New Testament works, including the Gospel of John. John the Apostle was the son of Zebedee, and the brother of James. One tradition gives his mother's name as Salome. They originally were fishermen and fished with their father in the Lake of Genesareth. He was first a disciple of John the Baptist and later one of the twelve apostles of Jesus. He is revered as a saint by most of Christianity. John had a prominent position in the Apostolic body. Peter, James and John were the only witnesses of the raising of Jairus' daughter (Mark 5:37), of the Transfiguration (Matthew 17:1) and of the Agony in Gethsemane (Matthew 26:37). Only he and Peter were sent into the city to make the preparation for the final Passover meal (the Last Supper) (Luke 22:8). At the meal itself, his place was next to Jesus on whose chest he leaned (John 13:23, 25). According to the general interpretation, John was also that "other disciple" who with Peter followed Jesus after the arrest into the palace of the high-priest (John 18:15). John alone remained near Jesus at the foot of the cross on Calvary with Jesus’ mother, Mary, and the pious women and took Mary into his care as the last legacy of Jesus (John 19:25-27). After the Resurrection, John with Peter was the first of the disciples to run towards the grave and he was the first to believe that Jesus had truly risen (John 20:2-10). The author of the Gospel of John was accustomed to indicate the apostle in writing, identifying him as: "the disciple whom Jesus loved". After Jesus’ Ascension and the descent of the Holy Spirit, John took, together with Peter, a prominent part in the founding and guidance of the church. Saint Maughold (Macaille, Maccaldus, Machalus, Machaoi, Machella, Maghor, Mawgan, Maccul, Macc Cuill) of Man (d. ca. 488 AD) is venerated as the patron saint of the Isle of Man. Tradition states that he was an Irish prince and captain of a band of thieves who was converted to Christianity by Saint Patrick. He retired to the Isle of Man after traveling by sea, either to avoid worldly temptation, or because Patrick had punished him by placing him in a coracle without oars. One local legend about what made Patrick punish Maughold relates how Maughold tried to make a fool out of Patrick. Maughold had, according to this story, placed a living man in a shroud. He then called for Patrick to try to revive the allegedly dead man. Patrick came, placed a hand on the shroud, and left. When Maughold and his friends opened the shroud, they found the man had died in the interim. One of Maughold's friends, a fellow named Connor, went over to Patrick's camp and apologized to him. Patrick returned and baptized all of the men assembled. He then blessed the man who had died, who immediately returned to life, and was also baptized. Patrick then criticized Maughold, saying he should have been helping his men into leading good lives, and told him he must make up for his evil. Maughold drifted to this isle, where two of Patrick's disciples, Romulus and Conindrus (Romuil and Conindri), were already established. He is said to have been chosen as bishop, succeeding Romuil and Conindri, by the Manx people after he had spent on the island as a hermit. Martyrology of Oengus describes him as "a rod of gold, a vast ingot, the great bishop MacCaille." Manghold made voyages to Wales and Scotland, but he should never return to Ireland. He is today best remembered on the Isle of Man for his kind disposition toward the Manx natives. Several places on the island, including, Maughold parish, Maughold Head, and St. Maughold's Well  are named after him. St. Thomas Becket, St. Thomas of Canterbury (c.1118 – December 29, 1170) was Archbishop of Canterbury from 1162 to 1170. He is venerated as a saint and martyr by both the Roman Catholic Church and the Anglican Church. He engaged in a conflict with King Henry II over the rights and privileges of the Church and was assassinated by followers of the king in Canterbury Cathedral. He is also commonly known as Thomas à Becket, although this form may not have been contemporary. Under the rule of King Henry II, Becket was Lord Chancellor. Henry desired to be absolute ruler of his dominions, both Church and State, and could find precedents in the traditions of the throne when he planned to do away with the special privileges of the English clergy. As Chancellor, Becket enforced the king’s Danegeld taxes, a traditional medieval land tax that was exacted from all landowners, including churches and bishoprics. He became an accomplished and extravagant courtier and a cheerful companion to the king's pleasures. Thomas achieved the position of power as the Archbishop of Canterbury in 1162. King Henry intended to further his influence by directing the actions of Thomas, his loyal appointee, and diminish the independence and affluence of the Church in England. The famous transformation of Becket into an ascetic occurred at this time. A rift grew between Henry and Thomas as the new Archbishop dropped his Chancellorship and consolidated the landed revenues of Canterbury under his control. So began a series of legal conflicts, such as the jurisdiction of secular courts over English clergy, which accelerated antipathy between the two great offices. The king gave vent to a passionate outburst which led to Becket's death. Becket was killed inside Canterbury Cathedral itself, in a spot near a door to the monastic cloister, the stairs into the crypt, and the stairs leading up into the quire of the cathedral, where the monks were chanting vespers. Prayer: O God, for the sake of Whose Church the glorious Bishop Thomas fell by the sword of ungodly men: grant, we beseech Thee, that all who implore his aid, may obtain the good fruit of his petition. Through our Lord Jesus Christ, Who livest and reignest with Thee in the unity of the Holy Ghost, forever and ever. Amen. Sabinus (d. 304) was a bishop in the Christian church who resisted the persecutions of Diocletian and was martyred and later made a saint. The Italian cities of Assisi, Faenza and Spoleto claim Sabinus to have been their bishop, but there is no proof for any of these claims. Venustian, governor of Etruria and Umbria had Sabinus and his deacons arrested in Assisi. Nothing is known about the life of the saint. Only the last part of his live, leading to his death and sainthood, seems to be known and even documented. In 303, Emperor Diocletian launched the last but also the greatest major persecution of Christians in the Roman Empire. It began with the destruction of Christian scriptures and places of worship across the Empire but soon, the reprisals became deadly. According to many estimates, a total of 3,000–3,500 Christians were killed in the persecution. Diocletian's order required all Christians to sacrifice to the gods or be put to death, with their estates seized for the state. Venustian mocked Sabinus's faith, accusing him of leading the people to the worship of a dead man. When Sabinus said that Christ rose on the third day, Venustian invited him to do the same thing. He had Sabinus's hands cut off. The deacons were in great fear, but Sabinus encouraged them to hold to their faith, and they died after being torn apart by iron hooks. In prison after the martyrdom of his deacons, he was tended by a woman named Serena. He healed a man born blind in prison. All the fifteen witnesses of this miracle converted to Christianity. Venustian heard of the cure and sought a cure for his own eyes from Sabinus. Sabinus healed the governor and converted him to Christianity. Venustian then sheltered Sabinus. Maximianus Herculius, hearing of this, ordered the tribune Lucius to address the matter. Lucius had Venustian, his wife, and his two sons beheaded at Assisi, and he had Sabinus beaten to death at Spoleto. He was buried near the street to Spoleto. Later, his bones were spread as relics over many Italian towns. Some even were brought to Windsberg abbey, near Straubing, in Bavaria. Pope Saint Sylvester I or Silvester I was pope from January 314 to December 31, 335, succeeding Pope Miltiades. The accounts of his Papacy preserved in the Liber Pontificalis (7th or 8th century) and in Anastasius are little else than a record of the gifts said to have been conferred on the Roman Church by Emperor Constantine I. These gifts, the so called Patrimonium Petri were the base of the Papal State. He was represented at the First Council of Nicaea, and is said to have held a council at Rome to condemn the heresies of Arius and others. The legend of his having baptized Constantine is fictional, as contemporary evidence shows the emperor to have received this rite near Nicomedia at the hands of Eusebius, bishop of that city. According to the 19th century historian Ignaz von Döllinger, the entire legend of Sylvester and Constantine, with all its details of Constantine's leprosy the proposed bath of blood and the Patrimonium Petri, cannot have been composed later than the close of the 5th century, while it is certainly alluded to by Gregory of Tours and Bede. The so-called Donation of Constantine was long ago shown to be spurious, but the document is of very considerable antiquity and quality, and in Döllinger's opinion, was forged in Rome between 752 and 777. It was certainly known to Pope Adrian I in 778, and was inserted in the false decretals towards the middle of the next century. Sylvester's legendary relationship to Constantine was important in the Middle Ages. Pope Sylvester II (999-1003), himself a close associate of Emperor Otto III, chose the name Sylvester in imitation of Sylvester I. As the feast day of St. Sylvester is December 31st, New Year's Eve is known as or also referred to as Sylvester in certain countries. His relics are housed in the church of San Silvestro in Capite, in Rome. The controversial author Malachi Martin alleges that Sylvester once met the Desposyni, members of Jesus's family. ^ Haliczer, Stephen (2002). Between exaltation and infamy: Female mystics in the Golden Age of Spain. Oxford: Oxford University Press. p. 236. ISBN 0195148630. This page was last edited on 24 October 2008, at 15:36 (UTC).